Ceiling Magma, originally uploaded by scjody. 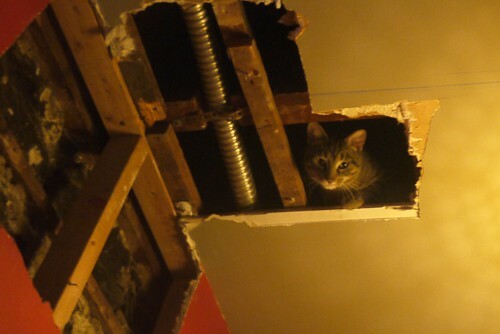 Liz & I put some holes in the walls and ceilings last Caturday as part of my renovation planning. It took Magma 6 days to figure out how to get up into the ceiling, but here he is! Meow! Someone you know says this therapist has helped her with a similar problem in concrete ways. The therapist offers a plan that focuses on helping you reach the goals you’ve set, and it’s clear to you how what the therapist does will help you reach your goals. This therapist uses a variety of methods depending on your problem and who you are. You have an ongoing sense that this therapist is more often than not helping you feel better in your life and helping your life work better. There’s no change in your life or how you feel or what you do after four sessions, or things actually get worse. The therapist seems uninterested in the concrete realities of your current life. The therapist is focused exclusively on ways you’ve been damaged, instead of on your needs or strengths. The therapist seems to have one all-purpose theory or “answer” that explains everything.